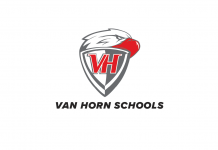 The members of the Van Horn School Band are beginning their fundraising efforts for the 2018-19 school year with a pie sale. The pies come from a Texas-owned and operated bakery in the San Antonio area. The products available are simply outstanding. They will be delivered in time for families to share and enjoy during the Christmas holidays. Prices range from $16 for most of the pies to $25 for the “Quatro” cheesecake. The Soaring Eagle Band is pleased to bring this delicious service to the Van Horn community. Funds will be used to support spring trips for the all of the band ensembles.